The population figures of fisherfolk in India are as fluid as the waters they depend upon. While the official count of the National Fisheries Development Board puts their number at 1.4 crore, the leaders of the community put it as at least three crore, including those who fish from ponds, rivers, brackish waters and from the sea. They are known by different names in each state, both on the coast and inland. 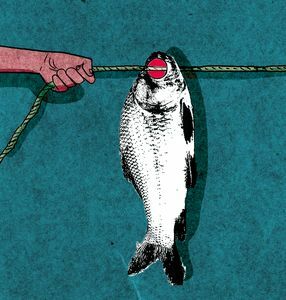 But the fisherfolk of the world’s second largest fishing economy (according to the Board) have now come into their own, with the Congress, the BJP and a slew of regional parties wooing them. It was Praveen Kumar Nishad, a young politician from the fisherfolk community, who gave the BJP’s new star Yogi Adityanath a shock by winning the Gorakhpur Lok Sabha seat vacated by him, on a Samajwadi Party ticket. The BJP quickly poached the red-capped Praveen, whose father, Sanjay, founded the Nishad Party to unite the pisciculturists of Uttar Pradesh. Praveen is now the BJP candidate from Gorakhpur, a seat long held by Rajputs. Now, the main fight in Gorakhpur is between two Nishads. Along the 8,000km long coastline of the country and the 1.9 lakh km long shoreline of rivers and canals, the fisherfolk are getting recognised by political parties. In Karnataka, the Congress has lent a former minister from the fishing community to be the JD(S) candidate to take on the upper caste dominance of BJP candidates in the state’s coastal constituencies. Like Muslims and dalits, fisherfolk are spread across the country, which has 74 lakh hectares of water bodies in the form of reservoirs, ponds, tanks, flood plains and brackish waters, in addition to seas and rivers. The mobilisation of fisherfolk has been traditionally done by Christian priests, socialist politicians and those who have risen up the IAS ladder from the community itself. It is no wonder that the BJP and the Congress have gone the extra mile in their manifestos to woo the community, which has a long list of grievances including not getting the scheduled caste and scheduled tribe status in different states. Congress president Rahul Gandhi promotes a fishermen’s cell in the party and its convener, T.N. Prathapan, is the Congress candidate from Thrissur in Kerala. Congress general secretaries were surprised by the hectic lobbying from different states for the convener’s post. The Congress manifesto said the party would establish a separate ministry for fisheries and welfare of fisherfolk. It promised to treat inland fisheries and aquaculture as agriculture and give the sector all benefits given to farmers. The Congress also promised the fisherfolk to address their problems of credit crunch and indebtedness. Recognising the plight of fisherfolk who stray into the territorial waters of Sri Lanka and Pakistan, facing death or detention, the Congress said it would provide a permanent mechanism for their safety. The BJP manifesto has promised Rs10,000 crore for a Matsya Sampada Yojana to help small fisherfolk with storage and marketing, and easy access to credit. It offered to expand Narendra Modi’s favourite social security net of accidental insurance to cover them. The BJP also promised to encourage harvesting seaweed, pearls and ornamental fish. With multiple baits being dangled for their votes, fisherfolk from Kashmir’s Dal lake to Kanyakumari’s seas have to choose carefully between tempting options.